Standing in the grounds of Castle Bernard, County Offaly, at a height of 2.40 metres is a sandstone cross with a damaged head. 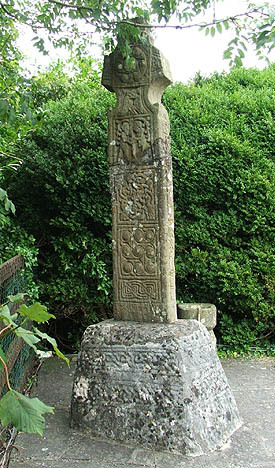 The cross was originally part of the monastic site founded in the sixth century by St Finian Cam although the cross was probably sculptured during the ninth century. The north face pictured right, bears seven bosses at the centre of the head standing above two affronted birds and the north shaft bears a figurative panel showing Adam and Eve above some decorative panels, details are shown below. At the centre of the head on the south side is a crucifixion scene and on the southern shaft a panel showing a David scene, although this panel is open to interpretation. At the bottom of the shaft on the north face an insciption reads: OR DO COLMAN DORRO..IN CROSSA AR RIG HEREEN. OR DO RIG HEREEN - A prayer for Colman who made the cross for the King of Ireland. A prayer for the King of Ireland. A second inscription on the south side reads: OR DO RIG MAELSECHNAILL M MAELRUANAID. OROIT AR RIG HEREEN-a prayer for King Máelsechnaill son of Maelruanaid. A prayer for the King of Ireland. Maelsechnaill the King of Ireland between 846 and 862CE. Pictured above are, a crucifixion on the head of the south face and a decorative panel on the north side of the shaft. The cross originally faced East - West but is now standing North - South. Situated: In the grounds of Castle Bernard, County Offaly. Discovery Map: 54 N 2026 0586. Seir Kieran: 7 Kilometres. WSW.